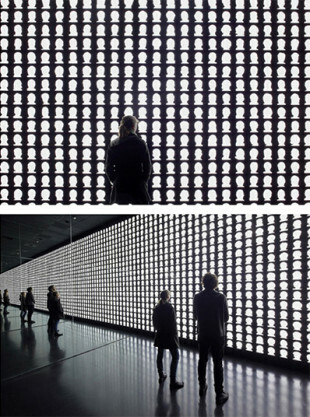 Alfredo Jaar’s ‘interventions,’ as he calls them, have occupied politically and culturally contested situations of exploitation, oppression and violence for more than thirty years. Jaar is highly respected internationally for his uncompromising stance, formed by coming to maturity in Chile after Allende’s deposition where, under the military junta, those critical of the regime routinely disappeared. Living in Manhattan since 1981 and trained as an architect and filmmaker, Jaar exploits the politics of image and text to give voice to those denied it. Remaining ever alert to ‘the moral quandary of spectatorship,’ Jaar’s penetrating gaze has been directed onto dictatorship, Brazilian gold mines, famine, injustice, genocide, ethnic and political violence, critiquing mainstream positions with diverse material forms of installations, including his 1987 public project, A Logo for America (1987) on the New York Times Square sign. Jaar’s response to the Rwandan genocide in 1994 exemplifies his ethics and deeply humanist approach. The massacre of one million Tutsis by Hutu death squads in one hundred days was shamefully all but ignored by the international community. Aid was finally extended once a further two million had been displaced in a mass exodus, and the shocking death rate had increased by another fifty thousand lost to thirst, starvation and disease. Three weeks after the genocide ceased, Jaar made a lengthy visit to Rwanda, taking over three thousand photographs. He reflected, ‘I have always been concerned with the disjunction between experience and what can be recorded photographically. In the case of Rwanda, the disjunction was enormous and the tragedy unrepresentable. This is why it was so important for me to speak with people, to record their words, their ideas, their feelings. I discovered that the truth of the tragedy was in the feelings, words, and ideas of those people, and not in the pictures.’ As memorial and as testament, twenty-one distinct projects flowed from Jaar’s Rwandan experience. Among many other awards, Jaar received a Guggenheim Fellowship in 1985 and the highly prestigious MacArthur Fellowship in 2000. Jaar has twice been included in Documenta in Kassel (1987, 2002), La Biennale di Venezia four times (1986, 2007 2009 and 2013, when he represented Chile), and the Sao Paolo Biennale three times (1985, 1987 and 2010). Jaar’s retrospective, ‘The Way It Is. An Aesthetics of Resistance’ was mounted across three institutions in Berlin in 2012; other important solo exhibitions have been mounted at The New Museum of Contemporary Art, New York; Whitechapel, London; the Museum of Contemporary Art, Chicago; Museum of Contemporary Art, Rome; Moderna Museet, Stockholm.